UFOs and other supposed alien spacecraft do not visit the Earth from the stars but rather from a distant point in humanity’s future. The shocking theory was presented by Montana Tech anthropology professor Michael P Masters, who penned a book on the bizarre topic. Speaking to KXLF, the anthropologist said: “The phenomenon may be our own distant descendants coming back through time to study us in their own evolutionary past.” According to Dr Masters, decades worth of UFO sightings and encounters have been mistaken for what they truly are. Claims of alien abductions and medical examinations, in his opinion, prove time travellers from the future are anthropologists much like himself. The majority of people who claim to have witnessed alien visitors to Earth have described humanoid extraterrestrials with incredible technology. Dr Masters referred to these time travelling scientists as “extra-tempestrials” or distant human descendants. The anthropologist, who specialises in UFO sightings, said these encounters can be explained scientifically, even if sceptics might consider this fringe science. The anthropologist explored this wild theory in his book Identified Flying Objects. The book claims future scientists travel backwards in time to study and better understand humans from the past. The expert’s book claims to use a “holistic analysis of human evolution, astronomy, astrobiology and the physics of time and time travel”. READ MORE: Does this 1917 photo prove time travel is possible? A brief overview of the book reads: “As an anthropologist who has worked on and directed numerous archaeological digs in Africa, France, and throughout the United States, it is easy to conceptualise just how much more could be learned about our own evolutionary history, if we currently possessed the technology to visit past periods of time. “This would undoubtedly facilitate in-depth, in-person analyses of the enigmatic, non-preservable aspects of our hominin ancestors. However, the anthropologist noted not everything he presents in his book is the absolute truth. Dr Masters said: “I continue to remain vigilant in my own scepticism. 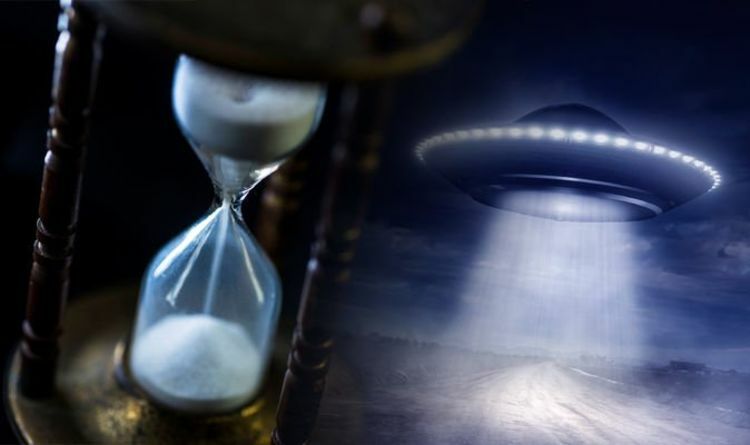 Whether or not UFOs are time travelling machines from the future, scientists believe it is important to examine claims of UFO sightings and other extraterrestrial phenomena. Kevin Knuth, a former NASA researcher and physicist at the University of Albany, warned UFO scepticism threatens to impede scientific discovery.